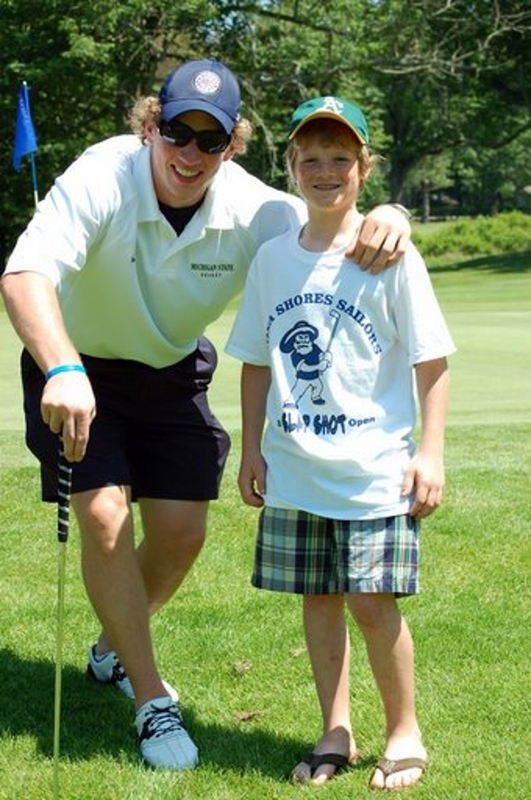 Justin Abdelkader pictured here with the official Slap Shot photographer Alec Sturr. 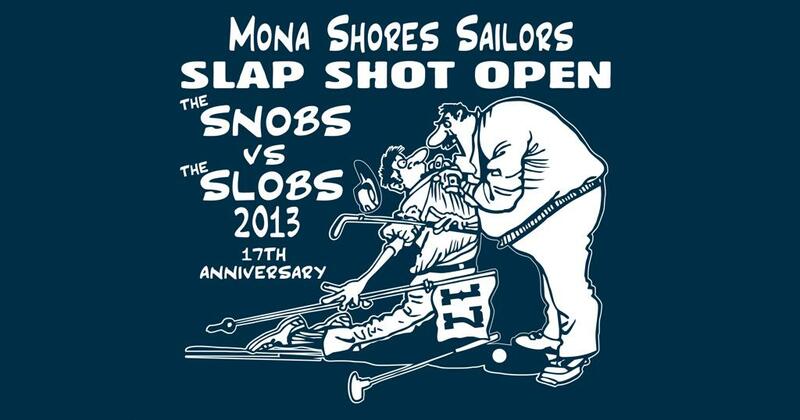 A celebrity studded 12th Annual Mona Shores Sailors Slapshot Open concluded on Friday, June 20th at Oakridge Golf Club on a perfect 75 degree, mostly sunny and slightly breezy afternoon in beautiful Norton Shores, MI. Sailors Board Members briefly flirted with the idea of a sudden death playoff, much like the US Open, when four powerhouse teams, those from Nexes, Advanced Signs, Teams Andrie, and Ulfsax, all found themselves deadlocked at 17 under after 18 physically demanding holes and 6010 yards for the green jacket, trophy, and future endorsement deals. 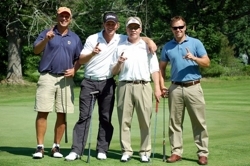 Instead, by working their way back SIX HOLES on the scorecard, team Nexes II and leader Brock "Roughrider" Carlston, backed by Nigel Hawryliw, Matt Wright, and Nolan Stier, were doused with milk and declared champions late into the evening. The amount of talent and notoriety at this year’s event was humbling. Witnesses reported sightings and participation by: Red Wings LW #8 and the last player to hoist this year’s Cup, Justin Abdelkader; former MS coaches Steve “Nubbs” Habetler and Shawn Zimmerman; West Michigan High School Hockey Blogger (http://westmichiganhshockey.blogspot.com/) Brian “Special Ed” Edwards; from Muskegon’s Hockey History and Heroes and the Muskegon Area Sports Hall of Fame, former Zephyr and Mohawk Brian McClay; former coach of the Indianapolis Razors of the WHA and Muskegon Mohawks, Gerry Moore; former Las Vegas long ball contestant Mike Edlund; former Mallard, Fury, and Davenport University hockey player and accomplished golfer Nigel Hawryliw; 1980's Mr. Michigan and former Conan the Barbarian from Universal Studio’s Ron Clark, current Sailor Coach Charlie "Lancelot" Link, and past Sailor greats Eric Duprey, Matt Ulfsax, Nolan Stier, JC Boyd, Scott Shrader, Adam Meloche, and many more. 1. Brian Speck shoots from the ladies Tee’s. His teammates still don’t use his drives. 5. When quick decisions need to be made in the heat of battle, it’s good to have President Tiefenthal around, such as when the beer cart girl blew a tire and all around her were losing their heads. 6. Air horns are banned when players are teeing off. The Best Looking Team (and First Place in Women's Division) went to: Gotcha Covered, Deb Sechen and teammates. 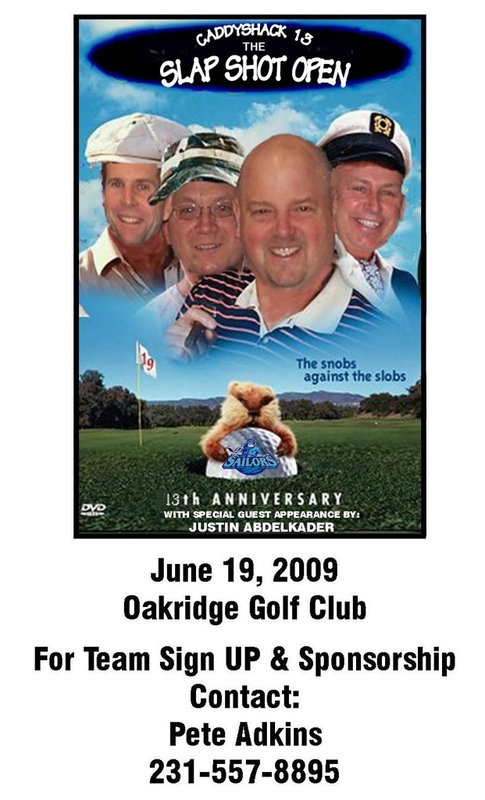 Loudest Music was won by Adventures in Advertising - Team McCarl, narrowly beating out the team of Craig Burrito Skocelas, whose boom box batteries died somewhere around the 15th hole. Most daring fashion statement went to the guy in the tuxedo tee, in a landslide over 2nd place Steve Habetler and daisy duke's fan Bill Hicks. 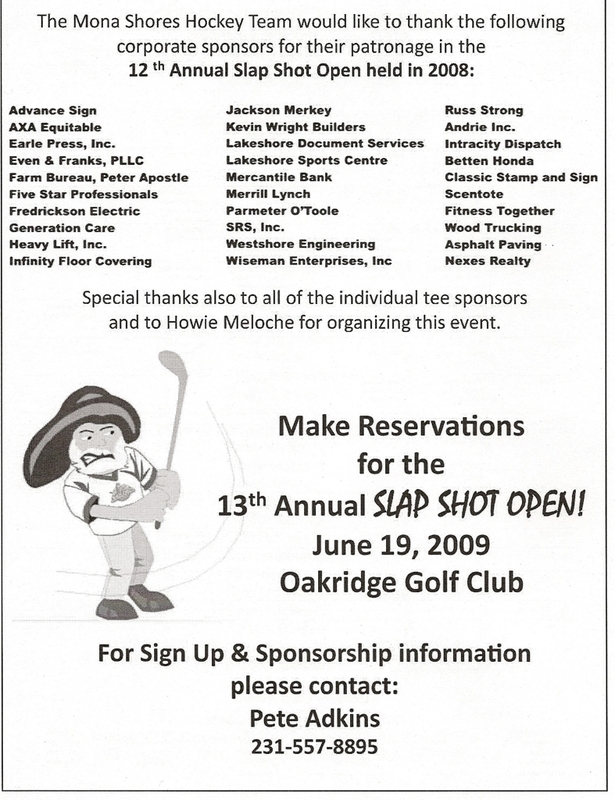 The Slapshot Open, the single largest fundraising event for the Sailors Hockey team, owes its success to all of the players who participated, all of the sponsors who continue to support the program, the coaches, parents, board members, and contributers who like Kip McCarl, “give and give” year after year. These benefactors include in roughly alphabetical order (and I apologize in advance for anyone I’ve forgotten): Howie Meloche from Betten, Billy Carlston & Roxie Deegan from Nexes, the Andrie’s, Advance Sign, Asphalt Paving, Betten Honda, AXA Equitable, Classic Stamp & Sign, Earle Press, Even & Franks, Farm Bureau - Peter Apostle, Fitness Together, Five Star Professionals, Fredrickson Electric , Generation Care, Heavy Lift Inc, Infinity Floor Cover, Intra City Dispatch, Jackson Merkey, Kevin Wright Builders, Lakeshore Document Services, Lakeshore Sports Centre, Mercantile Bank, Merrill Lynch, Nexes Realty, Parmenter O’Toole, Russ Strong, Scent Tote, SRS Hockey, Westshore Engineering, Wiseman Enterprises, and Trophy House/Jones Sports. 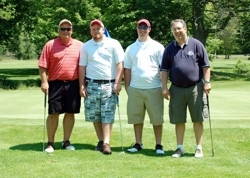 Tee Box Sponsors for this year’s tourney included: AMG Business Center, Brickley DeLong, East Muskegon Roofing & Sheet Metal, Dr. David Emig, Farwig Appraisal Services, Fox Financial Services, Gotcha Covered, Jack Timmer, JO Gallup, Morgan Stanley, Shoreline Mortgage Consultants, Dr. Tom Smith DDS, Warner Schuitema, Waterstone Insurance, Tru Tech Tool and Machine, B&B Beer Distributing, Reid Safety, Independent Bank, Cloetingh Insurance Agency, Hair-itage Salon & Day Spa, American Fidelity Mortgage, Nexes Title, and Muskegon Commerce Bank. Companies and/or individuals providing prizes included: Domino’s, Subway, Mango’s, Meijer, Walmart, Edward Jones, the Coffee House, Crystal Cool Ice, Wesco/On Your Way, Lincoln Golf Club, Stonegate, Heavy Lift, the Sailor Hockey Club, Jack Hamm, Lakeside Marine, Laura Fri, Andy Tejchma, House of Chan/Joe’s Steak House, the Boyd’s, Independent Bank, Adventures In Advertising, Kerry Clements, Jim Mylenek, Carol Fisher & Jill White from Aveo Hair Salon, the Station Grill, AMG Business Center, Salon RIAH, and Brian Inglat from Michigan Office Solutions. Special thanks to Howie “Howitzer” Meloche, Roxie Deegan and Billy Carlston for all they have done for the tournament and program and will leave behind very large golf shoes to fill. Additional props go to young Alec Sturr, whose dad Eric Sturr always tries to take credit for his skills behind the camera and whose work can be seen at: http://picasaweb.google.com/esturr/2008MonaShoresSlapshotOpen. 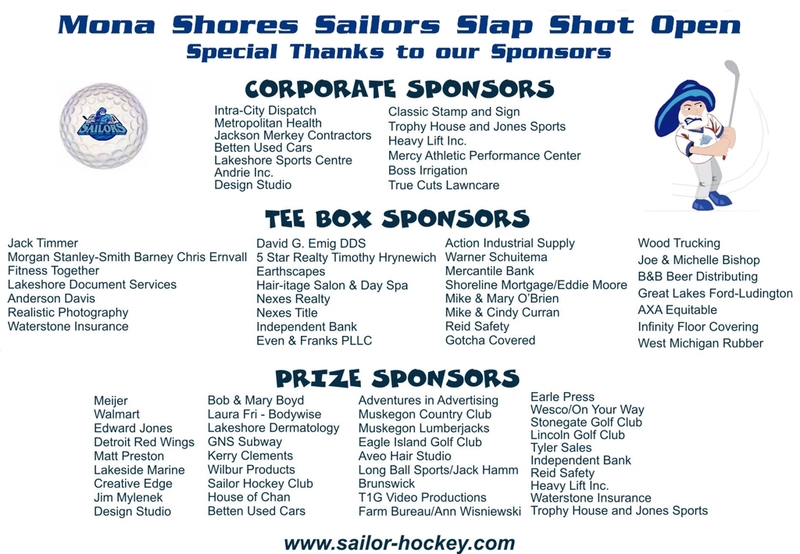 Mona Shore Hockey Club Would like to thank all of our corporate sponsors. 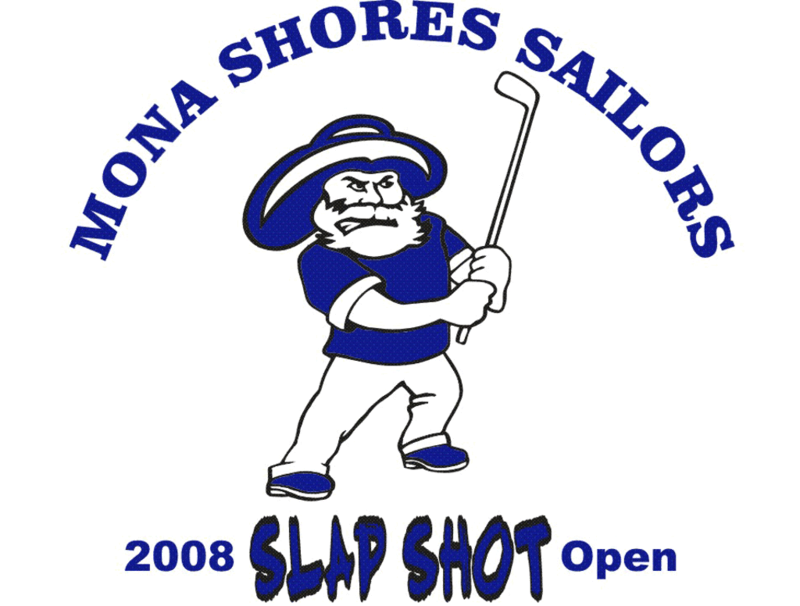 With thier help Mona Shores Hockey continues to grow and become stronger. Generation Care Heavy Lift Inc. Registration and Sponsorship Forms Available for Download !!! Please download the attached forms that you will need to submit your team and/or sponsorship information to us. 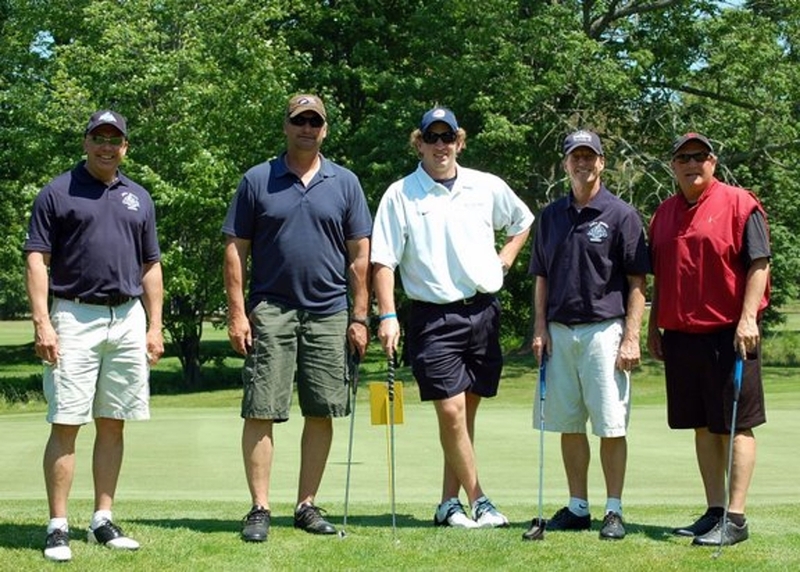 Make the checks payable to the Mona Shores Hockey Club and mail to the address as noted.